For the character in Grand Theft Auto 2, see Dodo (GTA 2). A Dodo in GTA III. 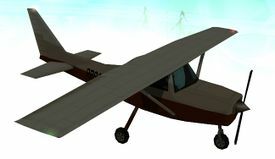 The Dodo is a small airplane appearing in both Grand Theft Auto III and Grand Theft Auto: San Andreas. In Grand Theft Auto: Liberty City Stories, the Dodo can only be obtained through third-party modifications. In general, the GTA III rendition has short, stubby wings that appear to have been sawed off at the mid-point in order to make it virtually impossible to fly (hence the name, Dodo), while the GTA San Andreas rendition features a complete wing span. It strongly resembles an older Cessna 152, and is always painted red and white. The Dodo, with or without wings, behaves the same on ground - the faster its propeller spins, more unstable it is. Winged Dodos are seen flying around in both Liberty City and Vice City, often towing fliers in the latter case. They can be shot down with rockets (either with a weapon or the Hunter), earning the player an instant 3-star wanted level. As the GTA III rendition of the controllable Dodo evidently features shorter wings, the plane is considerably difficult to control; often, a normal pitch or roll may send the plane plummeting out of control, and the thrust of the engine alone cannot be relied on to aid in lift. According to Rockstar Games themselves, the Dodo wasn't meant to be properly flown. The Dodo is thus intended to only remain in the air for short periods of time, but it is possible for the plane to continuously stay airborne through specific techniques. While accelerating down a long, flat surfacing, keep the elevators down, gradually increasing the downward pitch of the plane. When the pitch of the plane is low enough that sparks from the propeller scraping the ground are visible and can be heard, release the elevator. The plane should lift off and fly proper. The player is not required to hold on to the plane's acceleration to ensure smooth flying. Each time the nose of the plane rises, the player must press the down button/key to keep the plane flying in a straight line and to prevent it from nose diving. Avoid pressing the up button/key to gain altitude, as it rises the plane's nose thus slowing it down and, as stated above, causes it to nose dive if done continuously. The Dodo will continuously be in phugoid when in flight. After flying a certain distance, the Dodo is expected to pitch downwards, but will soon pitch upwards again after gaining momentum and lift from the fall, repeating the same drop-rise sequence over again. From takeoff onwards, the player must be wary of the pitch of the plane, doing their best to level the Dodo to ensure the plane does not ascend or descend too quickly, as it will result in more violent fluctuations in flight and increases the risk of crashing. Rolling (steering) of the Dodo must also be done with care by softly tapping the directional controls of the plane instead of holding them, which results in violent rolling and leading to the plane dropping from the sky. If controlled properly, the Dodo can reach great heights, even flying over skyscrapers (see this video). The Dodo may also be used to reach inaccessible parts of the city, such as the Ghost Town, or the Easter egg text on the edge of the radar's map. Driven on the ground, the Dodo is equally hard to navigate due to a wide turning radius. Braking at high speeds is understandably poor, comparable to the Esperanto; using the handbrake usually reduces the braking distance by half. A Dodo in flight in GTA San Andreas. 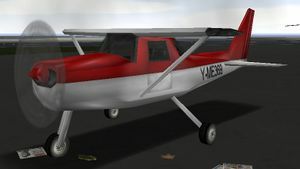 The Dodo in GTA San Andreas, with a complete wing span and full functionality, has far greater stability and control, and has an engine far more reliable in keeping the plane airborne (using Flying School methods, rather than the GTA III method). However, with a range of superior aircraft available in the game, the Dodo remains an undesirable option, being one of the slowest and most underpowered planes in game, although it is still considerably maneuverable. The Dodo is not seen flown by NPCs in the skies in GTA San Andreas. A Dodo in GTA Liberty City Stories, spawned using a trainer. The Dodo in GTA Liberty City Stories retains the same model from GTA III but is only obtainable through third-party modifications. However, it has no acceleration and therefore is useless, as it never moves, unless if the player uses a CheatDevice. In GTA III, two of Donald Love's missions involve the Dodo, A Drop in the Ocean requires the player to follow a Dodo in a boat and pick up the package it drops in the bay, and the other, Grand Theft Aero, requires the player to enter the same Dodo (parked in a hangar) to retrieve another package. Another mission, S.A.M. (for Asuka Kasen), requires the player to shoot one down with a rocket and collect the cargo it was carrying from the wreckage. In GTA San Andreas, during the mission "Freefall" the player must fly a Dodo above and behind a Shamal jet in which some Forelli hitmen are being transported, to do a hit for Salvatore Leone. The "Y-ME" prefix on the Dodo's registration number, GTA III. Due to a programmer error, the PC version of the GTA San Andreas Dodo lacks a sheen. The GTA San Andreas version of the Dodo contains no animation for the elevator movement (confirmed on PS2). The Dodo is mentioned in the handling file of Grand Theft Auto IV. The Dodo in GTA III and GTA Vice City (as the banner-pulling plane), bears the letters "Y", "M" and "E" at the beginning of the plane's registration number on the tail end of the fuselage, which reads similar to "Why me?". Like most other aircraft in GTA San Andreas, the Dodo plays K-DST by default. In the green hangar north of Francis International Airport (only after Grand Theft Aero). In the southwest hangar in Francis International Airport. In the east end of the runway in Francis International Airport. In Portland Import/Export Garage (once it is completed). In the east side of Los Santos International Airport, near the entrance. This Dodo is always unlocked regardless of the player's Pilot School progress, allowing the player access to an aircraft early in the game if they can get in the airport tarmac area via unusual means. Southeast of the main circle with grass in Easter Bay Airport in San Fierro. All around the west side of Las Venturas Airport. DeadDodo, an unobtainable, full-winged variant flying around in GTA III and GTA Vice City. Mammatus, a similar plane in Grand Theft Auto V which effectively fills in the role of the Dodo. This page was last modified on 13 January 2015, at 02:55.